Lung disease affects many people at all stages of life and newborn infants are the most vulnerable age group. Current treatment for lung disease is limited by a lack of tools to accurately assess lung function in the newborn period, resulting in treatments relying on expert opinion, rather than experimental findings. For instance, congenital diaphragmatic hernia (CDH), which manifests before birth and results in underdeveloped and hypoplastic lungs, causes serious complications at birth. We developed a model of CDH in newborn rabbit kittens and utilised phase contrast X-ray imaging to visualize lung aeration in real-time. We measured lung function in terms of regional aeration and functional residual capacity (volume of air retained in lungs between breaths). Our results demonstrated that the diseased lung inflated more slowly and retained less air between breaths, compared to healthy lungs, thus mimicking CDH in infants. Using this model we can now assess treatment modalities to identify the optimal treatment strategy to improve outcomes for newborn infants with CDH. Although respiratory failure is a major cause of death and disease in adults and children it is the greatest cause of death in newborn infants. However, our ability to study these diseases has been restricted by our inability to clearly image the lung, particularly the small airways, which harbour many of the pathologies. In particular, as infants transition to newborn life at birth, their airways must be cleared of liquid so that the lungs can immediately take over the role of gas exchange Hooper SB and Harding R: "Role of Aeration in the Physiological Adaptation of the Lung to Air- Breathing at Birth" Curr Respir Med Rev. 2005; 1 (2) 185-195.. However, if the lung has not grown properly during fetal life, the infant usually suffers respiratory failure. Phase contrast (PC) X-ray imaging greatly enhances image contrast by using the phase change of X-rays as they propagate through objects with different refractive indices. X-ray wavefronts refract as they pass between media with differing refractive indices, producing interference patterns that provide strong contrast at the material boundaries if the incident X-ray beam is sufficiently coherent[2-4] Kitchen MJ, Lewis RA, Morgan MJ, Wallace MJ, Siew ML, Siu KK, Habib A, Fouras A, Yagi N, Uesugi K and Hooper SB: "Dynamic measures of regional lung air volume using phase contrast x-ray imaging" Phys Med Biol. 2008; 53 (21) 6065-6077. Leong AFT, Fouras A, Islam MS, Wallace MJ, Hooper SB and Kitchen MJ: "High spatiotemporal resolution measurement of regional lung air volumes from 2D phase contrast x-ray images" Med Phys. 2013; 40 (4) 041909. Leong AFT, Paganin DM, Hooper SB, Siew ML and Kitchen MJ: "Measurement of absolute regional lung air volumes from near-field x-ray speckles" Opt Exp. 2013; 21 (23) 27905-27923.. The lung is ideally suited to PC X-ray imaging because it is mainly comprised of air (～80% at end-expiration), divided by thin tissue structures (mainly water). The air-tissue interfaces yield strong phase shifts, which make the normally invisible air-filled structures highly visible with X-rays[2-4] Kitchen MJ, Lewis RA, Morgan MJ, Wallace MJ, Siew ML, Siu KK, Habib A, Fouras A, Yagi N, Uesugi K and Hooper SB: "Dynamic measures of regional lung air volume using phase contrast x-ray imaging" Phys Med Biol. 2008; 53 (21) 6065-6077. Leong AFT, Paganin DM, Hooper SB, Siew ML and Kitchen MJ: "Measurement of absolute regional lung air volumes from near-field x-ray speckles" Opt Exp. 2013; 21 (23) 27905-27923.. Using this technique we can measure the spatial and temporal pattern of airway liquid clearance at birth in order to determine the best support strategies to assist infants as they transition to newborn life. The transition to air-breathing at birth is a major physiological challenge. Before birth, the fetal lungs are liquid-filled and at birth the airways must be cleared of liquid to allow the entry of air Hooper SB, Kitchen MJ, Siew MLL, Lewis RA, Fouras A, te Pas AB, Siu KKW, Yagi N, Uesugi K and Wallace MJ: "Imaging lung aeration and lung liquid clearance at birth using phase contrast X-ray imaging" Clin Exp Pharmacol Physiol. 2009; 36 (1) 117-125.. This initiates a sequence of events that include re-organisation of the circulatory system to enable pulmonary gas exchange to commence Hooper SB, Polglase GR, Roehr CC: "Cardiopulmonary changes with aeration of the newborn lung" Paediatr Respir Rev. 2015; 16 (3) 147-150.. Although these major physiological events are caused by air entry into the lungs, we are only just beginning to understand the factors involved, particularly in infants with CDH. In these infants, at least one lung is underdeveloped and hypoplastic. This restricts ventilation to aerated regions of the lung, which reduces the lung's gas-exchange potential and increases the risk of lung injury caused by over-expansion of ventilated regions Ventre KM and Arnold JH: "High frequency oscillatory ventilation in acute respiratory failure" Paediatr Respir Rev. 2004; 5 (4) 323-332..
CDH is one of the commonest congenital abnormalities (1/3000 live births) and occurs when the diaphragm fails to separate the abdominal and thoracic compartments during development[8,9] Logan JW, Rice HE, Goldberg RN, Cotten CM: "Congenital diaphragmatic hernia: a systematic review and summary of best-evidence practice strategies" J Perinatol. 2007; 27 (9) 535-549. Reiss I, Schaible T, van den Hout L, Capolupo I, Allegaert K, van Heijst A, Gorett Silva M, Greenough A and Tibboel D: "Standardized postnatal management of infants with congenital diaphragmatic hernia in Europe: the CDH EURO Consortium consensus" Neonatology 2010; 98 (4) 354-364. (Figure 1). As a result, abdominal contents enter the chest causing severe lung hypoplasia by limiting the space for lung growth. As the lungs are not required for gas exchange before birth, CDH infants can be healthy in utero, but at birth over 90% suffer severe respiratory insufficiency[8,9] Logan JW, Rice HE, Goldberg RN, Cotten CM: "Congenital diaphragmatic hernia: a systematic review and summary of best-evidence practice strategies" J Perinatol. 2007; 27 (9) 535-549. Reiss I, Schaible T, van den Hout L, Capolupo I, Allegaert K, van Heijst A, Gorett Silva M, Greenough A and Tibboel D: "Standardized postnatal management of infants with congenital diaphragmatic hernia in Europe: the CDH EURO Consortium consensus" Neonatology 2010; 98 (4) 354-364.. This results in high mortality (～30%) and morbidity rates, with survivors suffering severe short and long-term morbidity Logan JW, Rice HE, Goldberg RN, Cotten CM: "Congenital diaphragmatic hernia: a systematic review and summary of best-evidence practice strategies" J Perinatol. 2007; 27 (9) 535-549.. As the reduction in lung growth is not uniform, marked functional differences exist across the lung, making it difficult to ventilate these infants without injuring healthy lung regions Logan JW, Cotten CM, Goldberg RN, Clark RH: "Mechanical ventilation strategies in the management of congenital diaphragmatic hernia" Semin Pediatr Surg. 2007; 16 (2) 115-125.. Due to an absence of research, current guidelines for managing CDH infants after birth are largely based upon expert opinion Reiss I, Schaible T, van den Hout L, Capolupo I, Allegaert K, van Heijst A, Gorett Silva M, Greenough A and Tibboel D: "Standardized postnatal management of infants with congenital diaphragmatic hernia in Europe: the CDH EURO Consortium consensus" Neonatology 2010; 98 (4) 354-364.. We aim to provide the evidence that will guide new strategies for assisting CDH infants at birth. Figure 1 Image depicts 3D CT reconstruction of the lung of a newborn rabbit with a diaphragmatic hernia on the left side. The left upper lobe (green) and left lower lobe (blue) are smaller and less developed than the right lung lobes. Healthy regions are depicted in red. When lung hypoplasia is unilateral (only one lung affected), large differences in compliance and gas exchange occur between the hypoplastic and healthy lungs. As such, CDH infants usually require invasive and prolonged respiratory support and have severe short and long-term respiratory morbidity. Of the survivors, 40-50% develop bronchopulmonary dysplasia requiring prolonged respiratory support (> 28 days), 16% require oxygen following discharge for over 14.5 months and 2% remain oxygen dependent at 2 years[11,12] Kotecha S, Barbato A, Bush A et al. : "Congenital diaphragmatic hernia" Eur Respir J. 2012; 39 (4) 820-829.
 van den Hout L, Reiss I, Felix JF et al. : "Risk factors for chronic lung disease and mortality in newborns with congenital diaphragmatic hernia" Neonatology 2010; 98 (4) 370-380..
We have employed PC X-ray imaging to investigate a model of CDH in newborn rabbits. In order to quantitatively assess lung function, we have developed new image processing algorithms that can accurately measure absolute regional lung air volumes from phase contrast images[2-4] Kitchen MJ, Lewis RA, Morgan MJ, Wallace MJ, Siew ML, Siu KK, Habib A, Fouras A, Yagi N, Uesugi K and Hooper SB: "Dynamic measures of regional lung air volume using phase contrast x-ray imaging" Phys Med Biol. 2008; 53 (21) 6065-6077. Leong AFT, Paganin DM, Hooper SB, Siew ML and Kitchen MJ: "Measurement of absolute regional lung air volumes from near-field x-ray speckles" Opt Exp. 2013; 21 (23) 27905-27923.. We used this data to ascertain accurate indicators of lung function at birth. Pregnant New Zealand white rabbits were anaesthetised and underwent surgery at 25 days gestation (term ～31 days gestation) to induce a unilateral diaphragmatic hernia in two kittens per litter. At 30 days gestation rabbits where again anaesthetised and a Cesarean-section was performed to exteriorize the kittens. Kittens with DHs (experimental group) and kittens without DHs (control group) were surgically intubated and delivered, then moved to the beamline hutch BL20B2 where ventilation commenced to attain 5 mL/kg tidal volume with a 5 cmH2O PEEP. X-ray imaging commenced prior to ventilation onset. We used propagation-based PC X-ray imaging with the object-to-detector distance set to 2 m. Images were taken at 5 Hz with an exposure time of 20 msec/frame at an energy of 24 keV (Figure 2). Sequentially acquired images were combined into a video which depicted the ventilation. Images were analysed for lung aeration in each region over time using custom-developed image processing algorithms[3,4] Leong AFT, Fouras A, Islam MS, Wallace MJ, Hooper SB and Kitchen MJ: "High spatiotemporal resolution measurement of regional lung air volumes from 2D phase contrast x-ray images" Med Phys. 2013; 40 (4) 041909. Leong AFT, Paganin DM, Hooper SB, Siew ML and Kitchen MJ: "Measurement of absolute regional lung air volumes from near-field x-ray speckles" Opt Exp. 2013; 21 (23) 27905-27923.. This information was used to determine lung function. Figure 2 Schematic diagram of the imaging setup at the SPring-8 synchrotron, BL20B2 Japan. 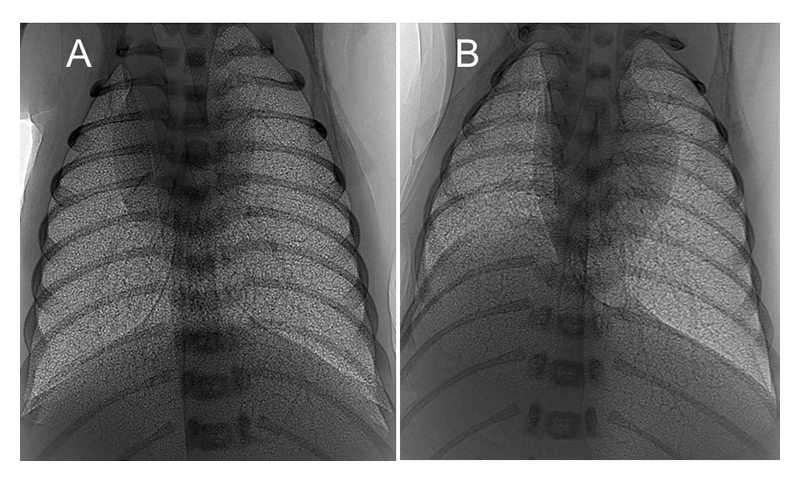 X-ray images depict clear differences in the aeration between the diaphragmatic hernia lung and the heathy lung, and between control no DH lungs and DH lungs (Figure 3). Figure 3 PC X-ray images of a ventilated control (A) and left-sided diaphragmatic hernia (DH; B) rabbit kittens shortly after birth. Aeration and growth of the left lung are impaired by the DH (B). At birth, healthy lungs rapidly inflate and generate functional residual capacity (FRC), defined as the volume of air that remains in the lungs at the end-expiration and is indicative of overall lung function. A small FRC reveals that the lungs are functioning poorly and may be collapsing between breaths, resulting in respiratory distress and reduced oxygen supply. Our data showed that both the control kitten's lungs and the healthy lung of the DH kittens inflated rapidly and reached maximal FRC in less than 200 frames (40 s; Figures 4-6). The DH lung inflated slowly and did not reach maximal FRC, indicating poor lung function. As the DH lung is much smaller and stiffer than the healthy lung, it aerates much more slowly, leading to non-uniform ventilation. This is displayed in figure 4 where the difference in FRC between the two lungs is very large initially in DH kittens with the healthy lung overinflating, likely causing tissue damage, and the hypoplastic lung underinflating, which risks atelectasis injury. Lung injury at birth is closely linked to life long lung disease Clark RH, Gerstmann DR, Jobe AH, Moffitt ST, Slutsky AS and Yoder BA: "Lung injury in neonates: Causes, strategies for prevention, and long-term consequences" J Pediatr. 2001; 139 (4) 478-486.. Figure 4 Air volumes measured from X-ray images of mechanically ventilated control and DH rabbit kittens during lung aeration after birth. 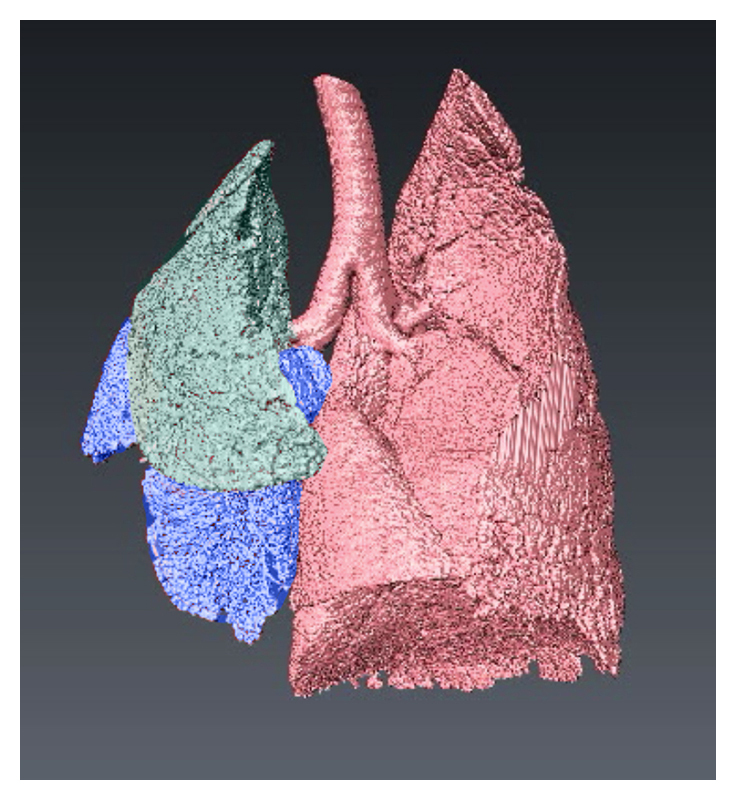 The hypoplastic left lung (blue) aerates more slowly than the right (green). The oscillations in volume reflect tidal volume changes. The increasing baseline (black) indicates an increasing FRC. Figure 5 The hypoplastic (left) lung of DH rabbit kittens aerated more slowly than the healthy lung (*p < 0.05) and than the left lung in control rabbits (#p < 0.05). Figure 6 The FRC of the left lung was lower than the right lung in both control and DH rabbit kittens (*p < 0.05). 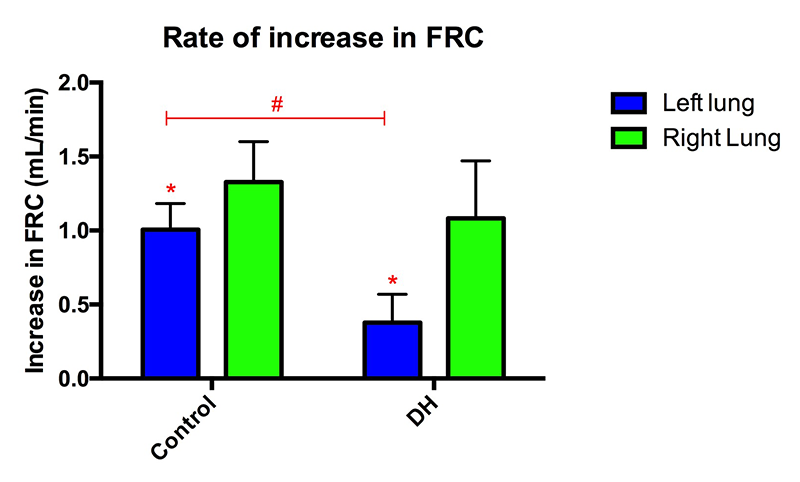 The FRC of the left (hypoplastic) lung in DH rabbits was less than that in the left lung of control kittens (#p < 0.05). Lung disease can be difficult to detect and measure. We used PC X-ray imaging to visualize the lungs in a model that mimics the lung disease seen in newborn infants with a CDH. 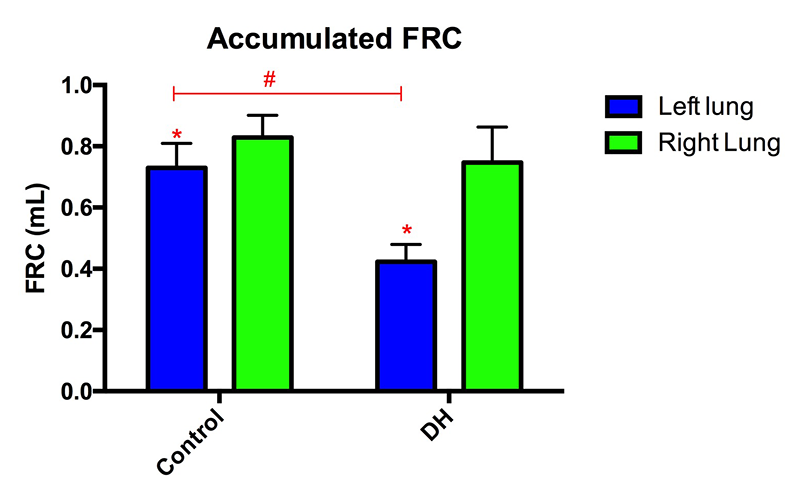 Our data demonstrated non-uniform ventilation in newborn rabbit kittens with DH. This increases the risk of over-distension injury in the healthy lung and atelectasis injury in the hypoplastic lung. This imaging technique will allow us to discern which respiratory support strategies are likely to most effectively aerate the lung and reduce lung injury in CDH infants at birth. Hooper SB and Harding R: "Role of Aeration in the Physiological Adaptation of the Lung to Air- Breathing at Birth" Curr Respir Med Rev. 2005; 1 (2) 185-195. Kitchen MJ, Lewis RA, Morgan MJ, Wallace MJ, Siew ML, Siu KK, Habib A, Fouras A, Yagi N, Uesugi K and Hooper SB: "Dynamic measures of regional lung air volume using phase contrast x-ray imaging" Phys Med Biol. 2008; 53 (21) 6065-6077. Leong AFT, Paganin DM, Hooper SB, Siew ML and Kitchen MJ: "Measurement of absolute regional lung air volumes from near-field x-ray speckles" Opt Exp. 2013; 21 (23) 27905-27923. Hooper SB, Kitchen MJ, Siew MLL, Lewis RA, Fouras A, te Pas AB, Siu KKW, Yagi N, Uesugi K and Wallace MJ: "Imaging lung aeration and lung liquid clearance at birth using phase contrast X-ray imaging" Clin Exp Pharmacol Physiol. 2009; 36 (1) 117-125. Hooper SB, Polglase GR, Roehr CC: "Cardiopulmonary changes with aeration of the newborn lung" Paediatr Respir Rev. 2015; 16 (3) 147-150. Ventre KM and Arnold JH: "High frequency oscillatory ventilation in acute respiratory failure" Paediatr Respir Rev. 2004; 5 (4) 323-332. Logan JW, Rice HE, Goldberg RN, Cotten CM: "Congenital diaphragmatic hernia: a systematic review and summary of best-evidence practice strategies" J Perinatol. 2007; 27 (9) 535-549. Reiss I, Schaible T, van den Hout L, Capolupo I, Allegaert K, van Heijst A, Gorett Silva M, Greenough A and Tibboel D: "Standardized postnatal management of infants with congenital diaphragmatic hernia in Europe: the CDH EURO Consortium consensus" Neonatology 2010; 98 (4) 354-364. Logan JW, Cotten CM, Goldberg RN, Clark RH: "Mechanical ventilation strategies in the management of congenital diaphragmatic hernia" Semin Pediatr Surg. 2007; 16 (2) 115-125. Kotecha S, Barbato A, Bush A et al. : "Congenital diaphragmatic hernia" Eur Respir J. 2012; 39 (4) 820-829.
 van den Hout L, Reiss I, Felix JF et al. : "Risk factors for chronic lung disease and mortality in newborns with congenital diaphragmatic hernia" Neonatology 2010; 98 (4) 370-380. Clark RH, Gerstmann DR, Jobe AH, Moffitt ST, Slutsky AS and Yoder BA: "Lung injury in neonates: Causes, strategies for prevention, and long-term consequences" J Pediatr. 2001; 139 (4) 478-486.